In this lesson you can learn about mixtures and solutions. What are mixtures and solutions? Mixtures are kind of solutions. You can find many mixtures and solutions in your day-to-day life. How is a solution made? When a substance dissolves in a liquid a solution is made. Seawater is a solution of salt and other substances in water. Fizzy drinks contain the gas carbon dioxide dissolved in water. Fish breathe oxygen that is dissolved in the water around them. What is meant by ‘soluble’? Soluble is the capability of being dissolved in a solvent. When a substance is capable of being dissolved in a solvent, such as water that substance is a soluble substance. What is meant by ‘insoluble’? Insoluble is the incapability of being dissolved in a solvent. When a substance is incapable of being dissolved in a solvent, such as water that substance is an insoluble substance. Solvent is a liquid substance capable of dissolving other substances. When a liquid dissolves a substance to form a solution it is a solvent. e.g. – The best solvent in the world is water. 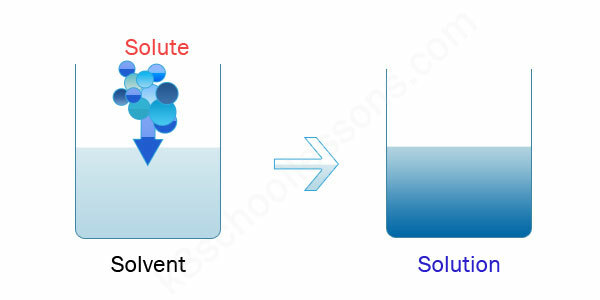 The substance that dissolves in a solvent is called the ‘solute’. 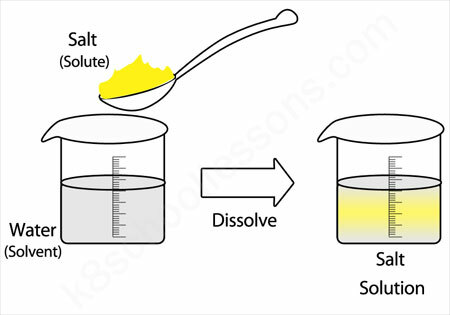 When a solute dissolves in a solvent, that mixture is called a ‘solution’. If you put a teaspoon of salt in a glass of water, the salt seems to disappear and you have a salt solution. If you put a teaspoon of sugar in a glass of water, the sugar seems to disappear and you have a sugar solution. If you add a teaspoon of sugar to a glass of water, all the sugar will dissolve. How does this happen? Water is made of very tiny particles. Sugar is made of slightly larger particles. Water particles have small spaces between them. They are close together and always moving. So if you add a teaspoon of sugar to a glass of water, the small moving water particles get between the larger sugar particles. Therefore we can see, sugar dissolves in water. Now you have a sugar solution. If you add more and more sugar to a glass of water, eventually no more sugar will dissolve. How does this happen? If you add more and more sugar to a glass of water, gradually the amount of water particles will decrease and the amount of sugar particles will increase. Eventually there will be no more water particles to get between the sugar particles. Now you have a saturated sugar solution. What is a ‘saturated solution’? A solution that contains all the dissolved substances it can hold is called a saturated solution. Some substances are very soluble. That means a lot of them dissolve in a certain amount of liquid. Some substances are slightly soluble. What is meant by ‘evaporating’? The changing of a liquid into a vapour is called evaporating. Heat the sugar solution on a saucer. Then the water in the sugar solution can evaporate away leaving the sugar on the saucer.